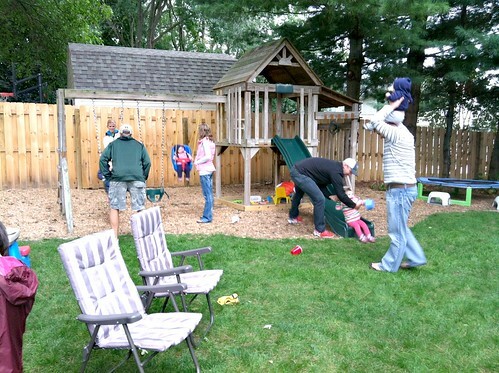 When we finally finished our summer-long landscaping project, Dave and I decided that we really shouldn’t end a long summer of yard work without having a bunch of friends over for a backyard BBQ. Of course, our friends were all on board for a free dinner… however, once Labor Day came and went, we felt like a traditional BBQ with burgers, brats, and all the fixings just didn’t seem right. The weather was getting cooler, the leaves were starting to change color, and despite my intense double cheeseburger cravings, I was in the mood for more “fall foods”. So we opted for a homemade soup and bread buffet. I think everyone had a really good time. Believe it or not, entertaining is actually kind of overwhelming for me — and although I WANT to do it, I don’t really love doing it, if that makes any sense! I guess I just don’t always love the extra work involved — because it IS work, even if you make simple meals and don’t stress about having a perfectly clean or decorated house (which I don’t). I still need to come up with a menu, choose foods that hopefully everyone will like and be able to eat, make sure I have all the ingredients, buy the things I don’t have, prepare the food, have everything ready at the right time, have dishes and cutlery easily accessible, etc. etc. As you’ll see by the severe lack of “final product” food pictures in this post, I really do try to keep entertaining as simple as possible — no cute decorations, no themes, no fancy foods, no staged food table for pretty pictures, and no beautiful serving platters. My main goal is to make enough food, keep it hot, and hopefully make everyone feel comfortable (like they don’t need to worry about their kids spilling or something). Fortunately for me (but unfortunately for this blog post) I was having too much fun eating, mingling with friends, and chasing after Nora that I never got any pictures of the finished foods before everyone dug in… and I only have one picture of the mostly-empty food table. 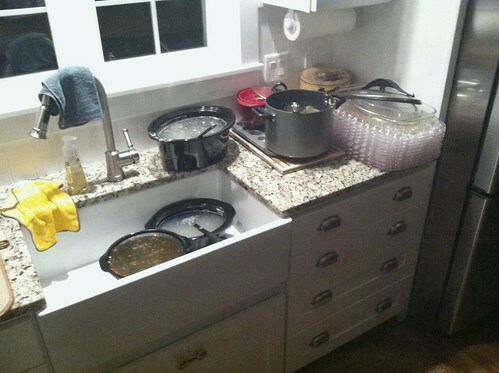 It might sound overwhelming to cook for a crowd — but as you’ll see below, I did a TON of the work ahead of time. In fact, the day of the party, I just dumped stuff in the different slow cookers, baked the bread, and helped Dave finish up some yard work. We had it all set up in (and directly outside of) our outbuilding — which is basically a 2-stall garage on one side and a very casual “living room” on the other side. So as I mentioned above, I did pretty much all the prep work ahead of time — and when it comes to soup, prep work is the majority of the work. Compiled all the recipes I wanted to make and listed off every single ingredient. Crossed off the items I already had in my house. Purchased the items I didn’t have on hand and mentally noted NOT to use any of them before the party! Made the Monster Cookie dough and put it in the refrigerator. 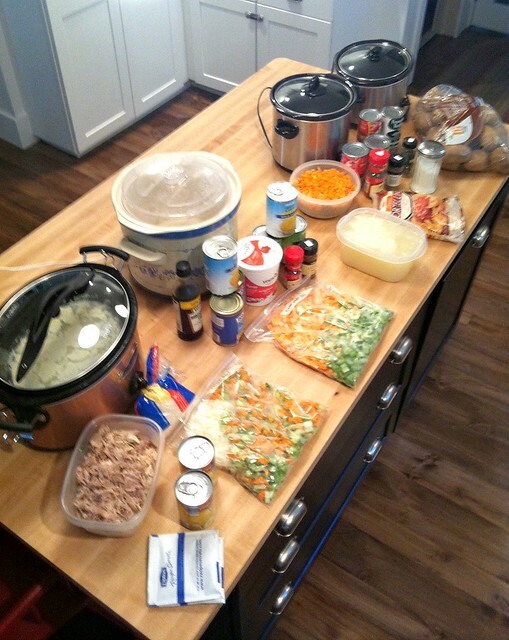 Put all the pre-measured items for each of the other 3 soups in large food storage containers or zip-top bags. Labeled the bags and containers as to which soup they were for and then put them in the fridge. I also borrowed 2 extra slow cookers from my sister and neighbor. Defrosted the frozen bread dough in the fridge. Got all paper products ready to go. Put drinks in refrigerator and made extra ice. 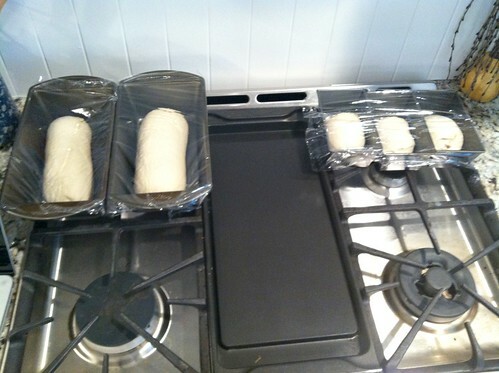 Let the bread dough rise at room temperature. Got out the slow cookers, the bags/containers of soup ingredients, the additional canned ingredients, and spices that were needed for each soup. 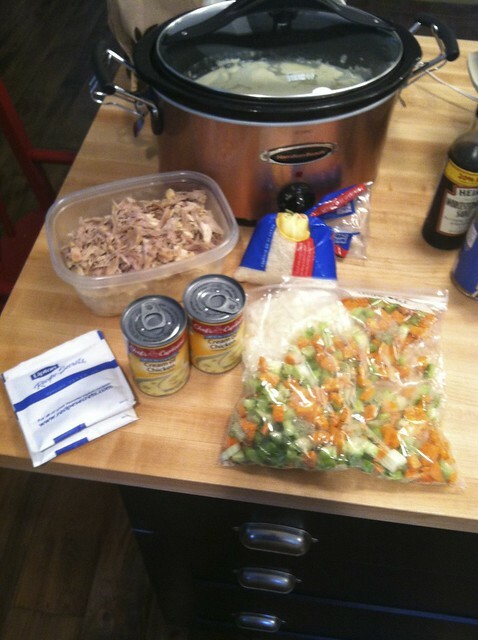 To be sure I wasn’t forgetting anything, I laid out all the ingredients for each soup next to the slow cooker I was going to use for that soup. I’m a very visual person, so this was actually really helpful for me and I realized that I did in fact forget one key ingredient for the chicken and rice soup. Luckily, we have a grocery store just down the road. Then all I had to do was dump the pre-cooked, pre-washed, pre-measured ingredients into the corresponding slow cookers and turn them on. Looking back, I don’t think there was any way I could have done everything if I had waited until the last day. Since we were eating early (shortly after 5:00) and the slow cookers needed to be on for 6-8 hours, I would have had to cook, sauté, chop, wash, and boil everything for 4 huge batches of soup by 10:00am or earlier — and on a Saturday morning, that just isn’t going to happen. 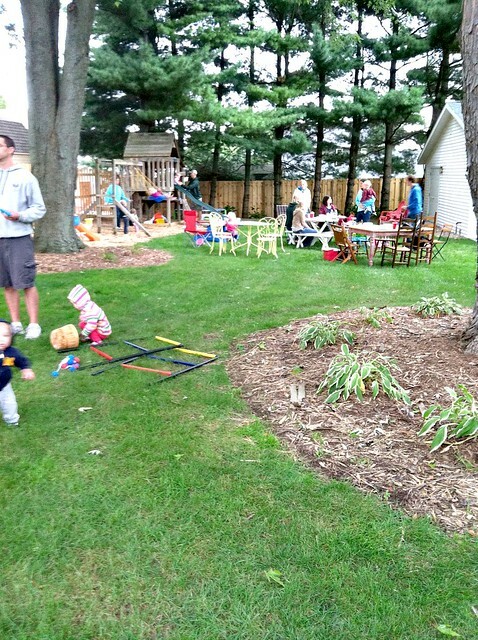 All in all, we had a really fun time, we ate A LOT, and Nora survived sharing her beloved toys. She even came up to me with a big smile the next day and said, “friends come over, I share toys, they give back toys”! Oh, and I should mention that for feeding 16 adults and 12 toddlers, the total cost was right around $90 (including the estimated cost for the food I already had in the house). I don’t do a ton of entertaining and we didn’t serve alcohol — but less than $3.25 per person sounds reasonable to me — especially since we ended up with 3 smaller containers of leftover soup and a bunch of brownies for the freezer! Frugality is obviously not the main reason I chose to serve homemade soup and bread, but it was definitely a perk — and might be something to consider if you’re hosting a party this fall or winter. What are your favorite foods for entertaining? Chocolate Cake... in my New Slow Cooker! You'll Never Guess Our Largest Monthly Expense! Was there room for everyone to sit down? What did you use to serve? Plates, paper bowls, cups, trays?? I’d like to try a soup and salad luncheon for a baby shower. 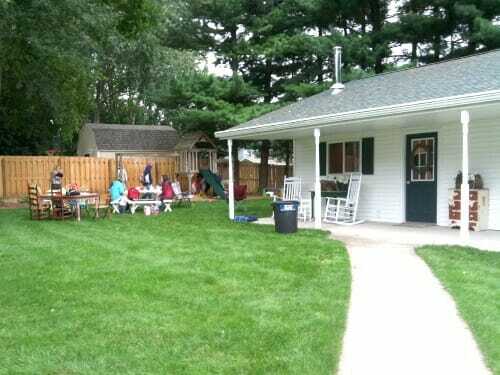 we had this party in the summer, so it was outside. I believe there were a few pictures of people sitting around tables outside. And we used paper products and trays to carry things on. This looks like a great idea! I looked at all four soup recipes and they all say something like “simmer for 40 minutes”. My question is, since you made them in the slow cookers, how long did you cook them and was it on low or high? Many thanks in advance for all info. Thanks Julie, I’m not a crock pot expert, but I usually cook just about everything on low for 6-8 hours. Just stir it a few times and test the vegetables to see if they are soft enough or not. If it’s getting close to dinner time and they aren’t super soft, turn it on high for the last hour or so. Andrea, you need to try crockpot liners. They are the best invention ever! Is the frozen bread dough your own recipe or store bought? Sometimes we serve chili and baked potatoes for a gathering. 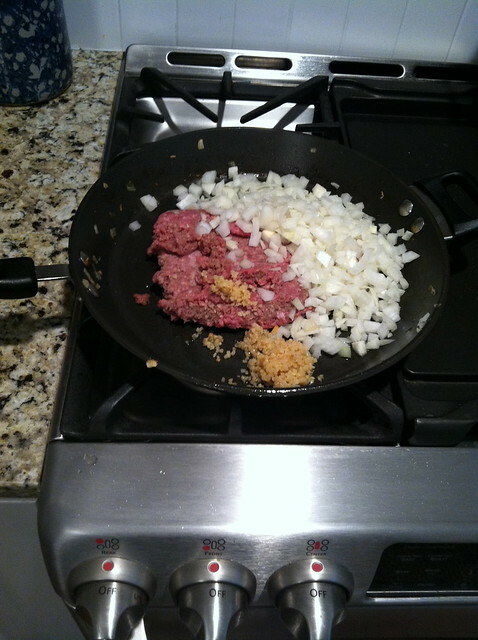 Both are easy to prepare, and the same toppings (cheese, sour cream, green onions, etc.) can be used for the chili and the potatoes. Topping the potatoes with the chili is another option. It’s a popular meal. I’ll check out your recipes. I love soup. I could eat it every day! Love this idea! Does the mashed potato soup freeze well? I’m hit or miss with freezable potato soup recipes! 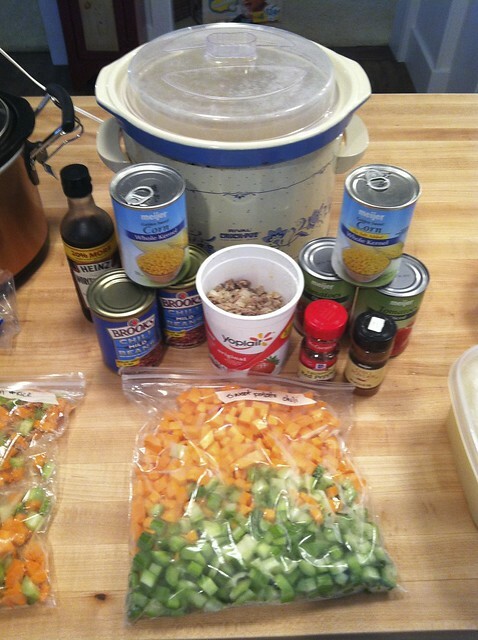 Many soups can be made ahead and frozen. You could make a double batch (or Triple) for a meal and then freeze the rest for the party. Between my Sister, sister in law and myself, we have 11 boys and 1 little girl. The oldest is 26 and the youngest is 5. We have found that soups are a popular meal when we get together. This is a rare occasion as we live in 3 different states. Every family brings a soup (or two) and some kind of bread or roll. This even manages to satisfy the hunger of the teenage boys! 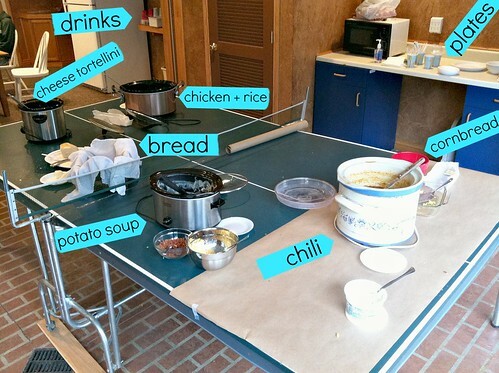 Thar was such a great tutorial on giving a Soup and Bread party I had to pin it in two places. For the people that are afraid to have a party of any sorts, this is the best plan I have seen on paper showing how to do it, This one is informal but the bones are there to move up to a more formal buffet dinner. Kudos!!!! 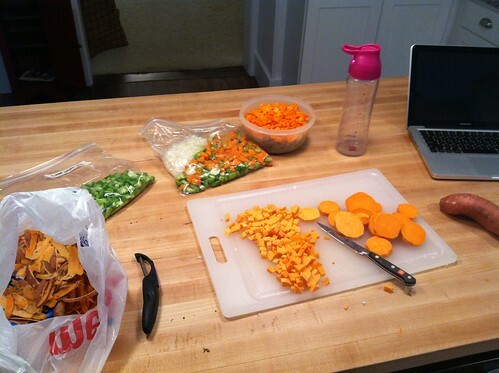 I noticed from the pictures that you seem to be using a small knife for cutting the vegetables. I did this for many years and finally learned how to use a chef’s knife for chopping. It has been amazing at how much faster this goes and takes a lot of the drudgery out of cooking. I would estimate that I can cut carrots, celery, onions and other similar vegetables in about a fourth of the time it would take with the smaller knifes. It takes practice and someone or a good tutorial, but it is really worth learning. I really recommend a real experienced teacher. Once you get past the fear of cutting off a finger, most people;’s mistake is cutting and completely bringing the knife off the surface and then the food goes flying. You tuck your knuckles under and keep them moving back to prevent a cut. You keep the very tip of your knife on the cutting board. And then it becomes a rhythmical up and down motion. And as you get more practiced you can speed up a bit. I find peppers and tomatoes the hardest to do like this, but most any other solid fruit of vegetable works well. Just remember to cut a flat bottom side first, so the item has a flat surface. Because a round carrot will fight back. Andrea, Love this idea! I have out of town relatives coming over Saturday night. We were thinking about grilling out, but I really love this idea! I have a couple of great soup recipes that I make often for my family. I think I’ll pull them out and have soup and bread instead. I live in the South, so Fall is just making its way here. This will be a great way to welcome the changing season. 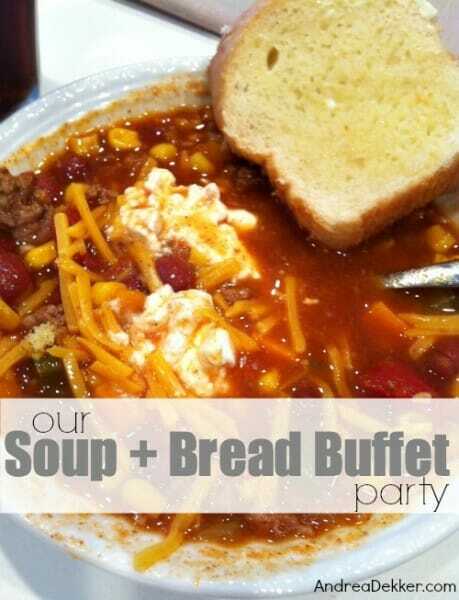 Loved the soup and bread party! Super simple and yet delicious especially, for a lovely fall day. Judging from the photos, everyone had a great time! I especially love the tortellini soup – my husbands always raves about it! Thanks for sharing. 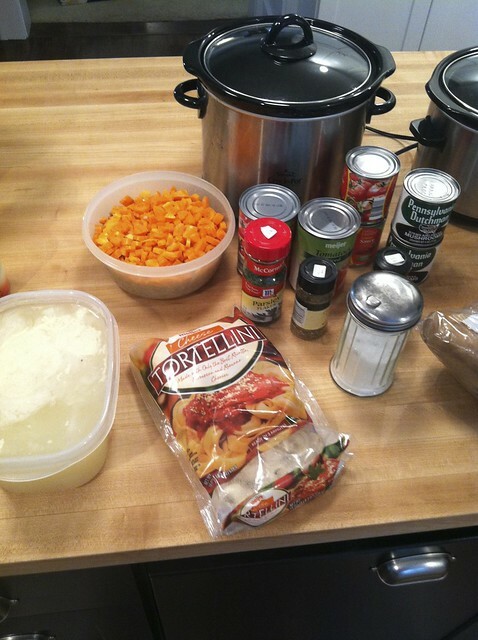 PS – Those soups look amazing!! We are finally getting some cooler weather here in Texas (yes, 80s is fall weather for us) so I can finally start breaking out the soups! 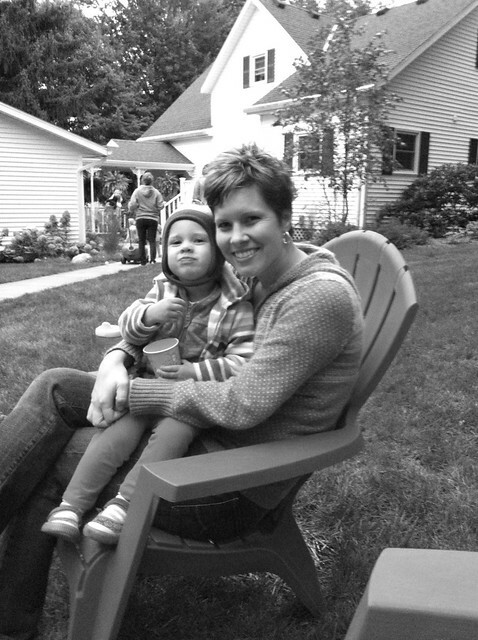 My husband & I moved into our wonderful neighborhood nearly a year ago. Your soup buffet has inspired me to host a similar event for our neighbors as a way of celebrating and showing our gratefulness for making us feel welcome here! Soup and bread are wonderful hospitality! One of my favorite winter evenings last year was spent at a friend’s. The day was rainy and chilly, and she had prepared a pot of soup and some crusty bread. With that and good companionship, what more do you need? I am not big on entertaining. cause I am always worried about making my guests happy.. I try to make whatever we are doing as simple as possible.. I think this is a great idea.. and looks like your guests were all happy ! 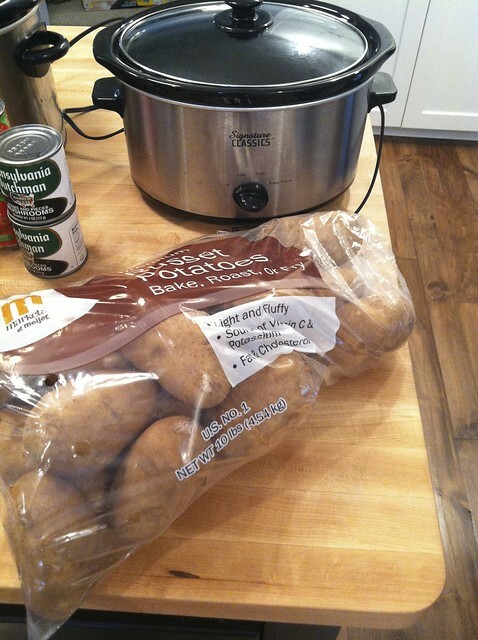 Christmas…kinda thinking soup & bread buffet is.the.way to go this year! Great idea of a different theme every year for family Christmas. Thanks, Amy, for mentioning it here. I like to entertain, but it’s also overwhelming at times for me too. It is a lot of work and more so when you have children. My menus vary according to who we are entertaining. I like to have a variety and usually include 2 main dishes, 2-3 sides, bread, and a dessert.